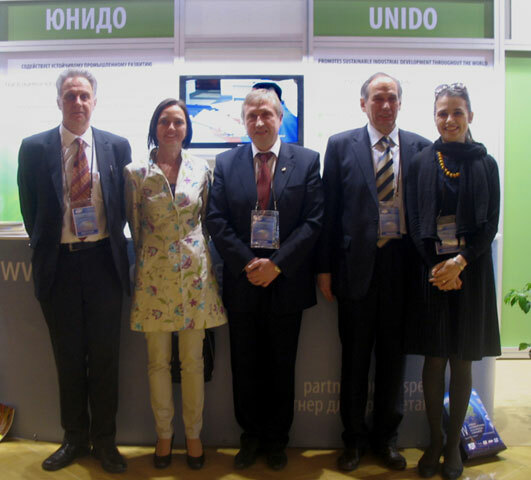 The fourth Nevsky International Environmental Congress was held in St. Petersburg at May 16-17, 2011. It was dedicated to the 20th anniversary of Commonwealth of Independent States. The congress was on the issues of world sustainable development, environmental protection and role of the state in the development of "green industry" and cleaner production - press-service of NTUU "KPI". Kandeh K. Yumkella, general director United Nations Industrial Development Organization (UNIDO), made a report on the implementation of "green economy". He said: "We need fundamental change in how we produce, consume and exchange goods. We have to make our development strategy and economics "green" and focused on the implementation of investment and innovation to create environmentally friendly technologies and industries. We should promote new "green" jobs in the industry". A logical follow-up to the theme started by the UNIDO Director General was analytical report presented during the "Green Technology" roundtable by the NTUU "KPI” rector – M. Zgurovsky, who is also an academician and scientific adviser of the World Data Center for Geoinformatics and Sustainable Development. In his report, Michael Zgurovsky shared the KPI scientific and practical achievements in the development of "green industry" - researches in the field of sustainable development indices and application of these developments in "green energy" projects for the regions of Ukraine and introduction of "smart technology" in the experimental power plants network of the KPI, which actually uses the principles of "green industry" architecture.